Instantly, the chat rooms filled with prognosticators debating the merits or lack thereof for Apple’s next big thing. But Apple’s announcement is both less and more important than you might think. Apple’s gold watch: How big a deal is it? It is less important because you can’t predict how popular the watch will be – let alone how much gold will go towards its production. Making investment decisions based upon a news tag like this one is simply not good strategy. In the overall scheme of things, how much supply an Apple gold watch soaks up is unlikely to be a game changer compared to other factors influencing the gold supply/demand universe. What makes this announcement very important is something that David Morgan has often discussed in his interviews at Money Metals Exchange and in presentations at conferences across North America. That concept is incremental demand. Over time, the gold and silver bull markets will be driven by the total overall demand change in relation to available supply. But big price changes are determined on the margins of demand. It is the continued addition of new uses for the precious metals – in both the industrial and investment arenas – that adds fuel to this long-term bull market. Individually, the myriad of new uses are small potatoes in terms of how much supply they command on their own. But taken together, they create small waves of desire to acquire these items. Over time, they have the potential to become demand “straws” that can break the supply camel’s back. This marginal action, combined with the primary big volume consumption drivers, may cause the price of a commodity – any commodity – to shift from a solid, plodding bull run, into a vertical, public mania-fueled moon shot. 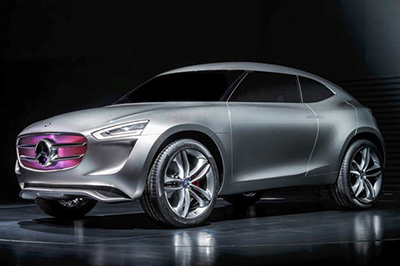 Here's one marginal demand change (just one of over 10,000 commercial uses) for silver: It’s a Mercedes-Benz Vision G-Code, whose skin acts as a solar panel. Frank Holmes popularized the terminology used to describe the twin drivers of gold demand, calling them the Fear Trade and the Love Trade. People around the globe buy and hold gold when they fear geo-political or economic uncertainty. By that definition, many places in the world today demonstrate a need for the kind of financial protection that precious metals have always offered. Venezuela, Argentina, Russia, Iraq, the Eurozone – the list gets longer by the week. Now too, this increasingly includes the United States, as investors and those who wish to protect a portion of their hard-earned savings from continued erosion by government deficit-spending and under-reported inflation start demanding more gold and silver. But people also buy precious metals to give as gifts, to show affection and respect – the Love Trade. Massive purchases throughout Asia, most notably in India and China, have established a durable demand trend that, in conjunction with Fear Trade buying, may move the tonnage of physical metals’ sales substantially higher. Silver benefits from this dynamic, which when added to its primary driver – industrial demand – makes for an even more compelling investment and wealth-protection magnet. And finally, there are platinum and palladium. With the lion’s share of both metals’ uses devoted to automotive and truck catalytic convertors, they should, by any definition, be first and foremost looked upon as industrial metals. However, in both Asia and the West, these two “silvery” metals are increasingly being purchased in ingot and bullion round forms for their investment value, and in the jewelry trade for their beauty and durability. With a market cap of nearly $1 trillion, and the complete instability of most global fiat, the move into gold watches with weight becomes a currency hedge for the company, in addition to being a revenue generator… The Apple watch can unlock your car and tell you how charged your electric car is, and I would argue this is the first "parabolic ramp up" of the love trade. It may also reintroduce the gold love to the West. 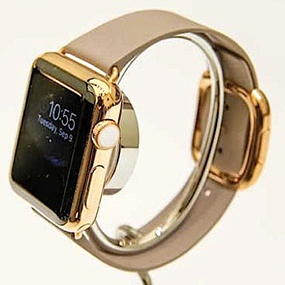 Gold iWatch Is One of Many "Straws in the Wind"
As an investor who is bullish on the precious metals, you want to see continued new uses being found for them. And that is exactly what is taking place in all four of today’s precious metals markets – gold, silver, platinum and palladium. Long before Apple made its gold watch announcement, precious metals were helping people “tell time.” They gave – and continue to give – those who possess them the ability of not only protecting their wealth, but often times their families’ lives during times of approaching financial storm and political strife. The clock is ticking.